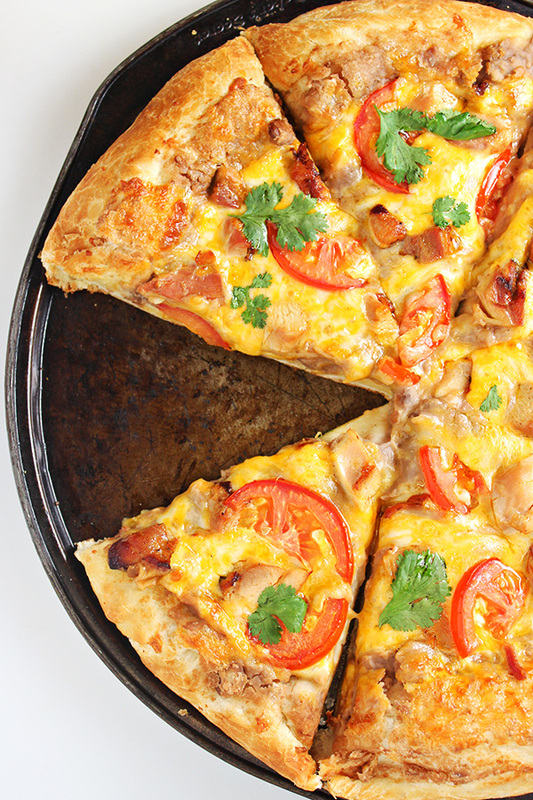 This Quick & Easy Mexican Pizza Recipe will get pizza night started in no time! 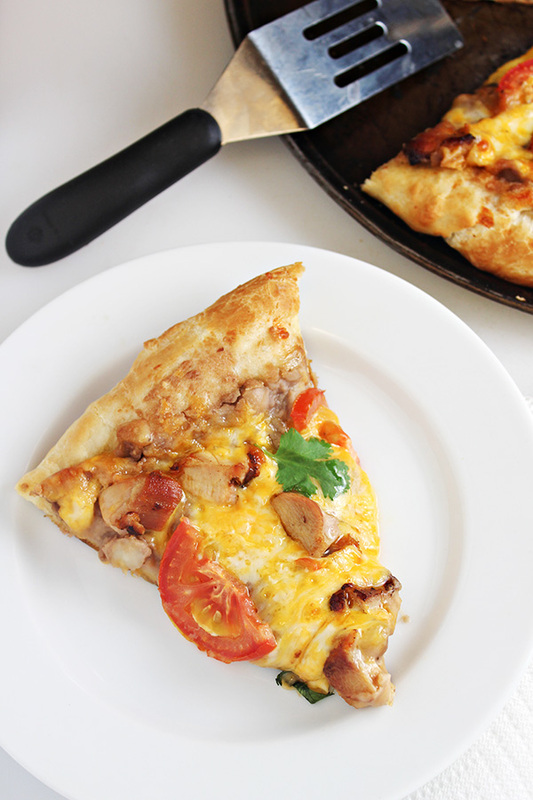 It uses only 5 ingredients: refried beans, cheese, chicken, tomatoes, and pizza dough. There is also a helpful list of delicious pizza topping ideas you can choose from to customize your own Mexican Pizza. In our home, Friday night is pizza night. Sometimes we do delivery, sometimes we get a take-and-bake pizza, and other times, we make homemade pizza. When I make homemade pizza, I always ask the family what kind of pizza they would like me to make. There is one pizza that every single person in my family requests: MEXICAN PIZZA! I’ve been making this Quick & Easy Mexican Pizza Recipe for years and years. It’s so simple to make that you don’t even have to wait for the weekend – it’s a great weeknight meal too! Refried Beans – this is the base of the pizza rather than using a traditional tomato-based pizza sauce. We usually buy a can of refried beans for this or use refrigerated Del Real Foods Frijoles Refritos. 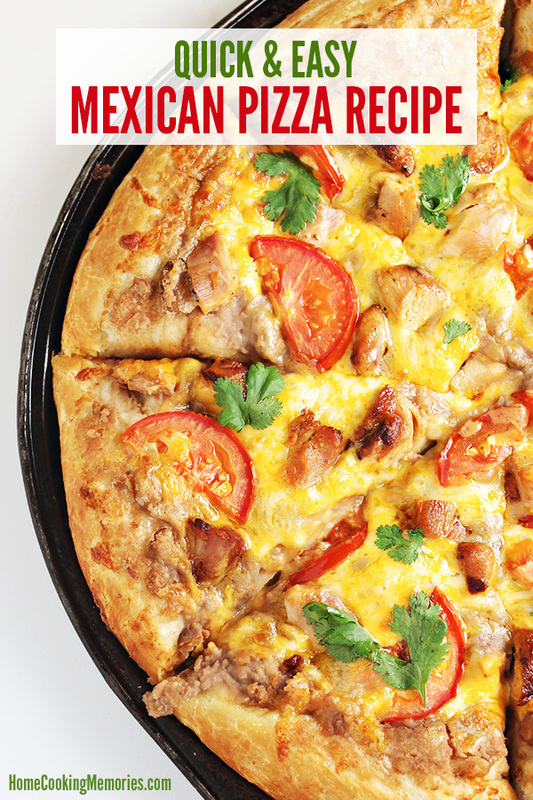 While those are our usual toppings, this Easy Mexican Pizza Recipe is extremely versatile. We enjoy changing up the toppings from time to time. Sometimes instead of chicken, we use chorizo (one of my favorites!!) or a simple ground beef taco meat. There are lots of ways you can top your Mexican Pizza – just check out our list below. To make your own Quick & Easy Mexican Pizza, you’ll start with a pound of pizza dough. While sometimes I make my own pizza dough, I often buy a pre-made pizza dough at my local grocery store (Winco). They sell it in 1 pound bags near the meat and deli department. If your grocery store doesn’t sell pre-made pizza dough, you can make your own pizza dough recipe, buy a pre-cooked pizza crust, or buy a tube of Pillsbury Classic Pizza Crust in the refrigerated dairy area of your grocery store. Press your dough out onto a greased pizza pan. 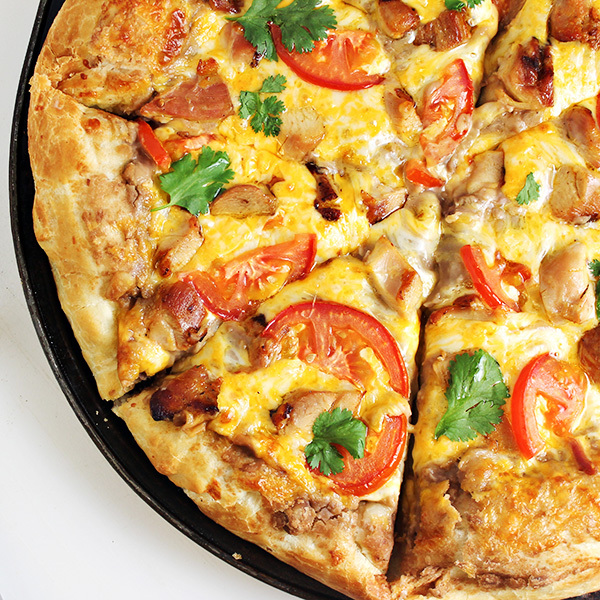 For this recipe, we used a 14″ round pizza pan. 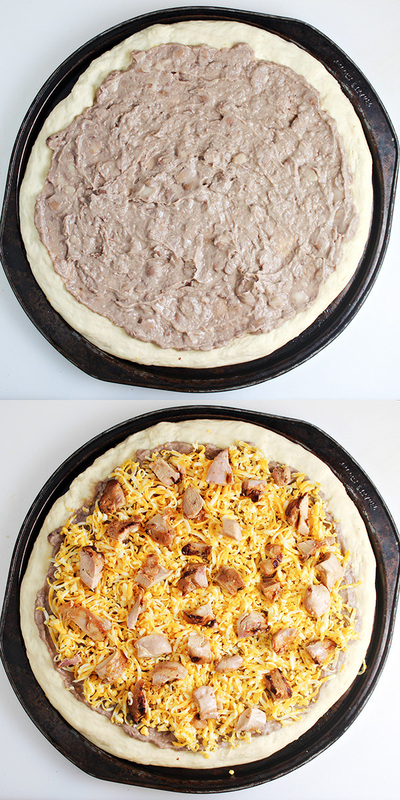 Spread the refried beans onto the pizza dough, leaving approximately 1″ on the edges uncovered. Next, top with your shredded cheese, followed by the chicken and sliced tomatoes. After you’ve added the toppings, it’s ready to bake! You will bake your Mexican Pizza until cheese is melted and beginning to brown and the crust is golden brown. Once it is done, remove from the oven and sprinkle with cilantro, if you wish. Your Mexican Pizza is ready to enjoy! Simply cut into slices with a pizza cutter and serve. 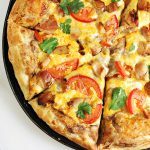 With this delicious and easy Mexican Pizza recipe with only 5 ingredients, you can have a cheesy homemade pizza on the table in no time! If using pizza dough, press pizza dough out on a greased 14″ round pizza pan (or another suitable baking sheet). If using premade pizza crust, place crust on baking sheet. Spread refried beans on pizza dough/crust, almost to edge but leaving a 1/2-1″ edge uncovered, all the way around. Top evenly with shredded cheese. Top cheese with cooked chicken and tomato slices. Bake in a 425 degree F oven for 12-15 minutes or until cheese is melted and beginning to brown and crust is golden. Remove from oven and sprinkle with cilantro leaves. Cut into slices and serve. –If you like a thin crust, you will need only 1/2 – 3/4 pound of pizza dough. Adjust baking time as necessary.